Faint Line on Drug Test - what does it mean? 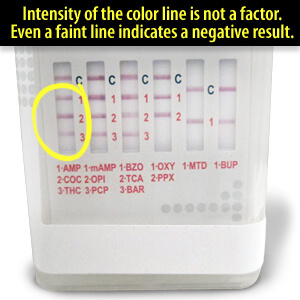 The intensity of the color of a line on the drug test does not mean anything and should not be interpreted as a measure of the amount of drugs. 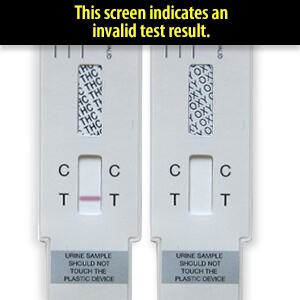 A faint line on a drug test is still a line, so if you have a faint line in the "T" area of the test then you have a negative drug screen. 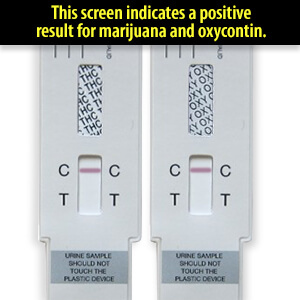 As you can see in the negative test results photos below, the THC strip is much lighter in color than the OXY test strip, but the test result is still negative. 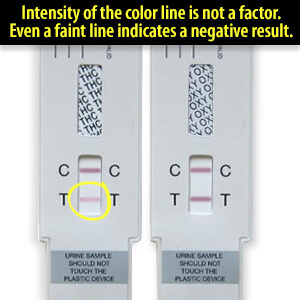 One of the most common questions we receive is about the faint lines on a drug test and we have confirmed this answer with the manufacturer of the tests - the intensity of the color of the line does not mean anything on the test. Any line in the "T" region of the test strip, dark or very light, is considered a negative test. The Control Region (C) line must appear at the top of each testing window. The results are read for each numbered line below the (C) line and the number corresponds to the drug letters printed below the window. Below are two examples, one with a 13 panel iCup with all negative results and the other showing a positive result for Opiates and Marijuana. Two lines of any color intensity appear. A colored line appears in the Control Region (C) and a colored line appears in the Test Region (T). Even if the line that appears is faint, the result should be considered negative. The possible shades of colored lines in the T Region may vary. 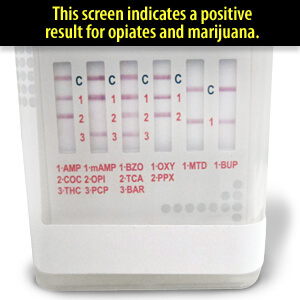 What does a Negative Drug Test result mean? Negative means that the concentrations in the urine sample are below the designated cut-off levels for a particular drug tested. A negative drug test result does not always mean there are no drugs present in the person being tested, it means there are not drugs present above the cut off limit. For example, the cutoff level for marijuana is 50 ng/mL, therefore a person with only 30 ng/mL of THC in their system would test negative on a marijuana drug test. The cutoff levels are suggested by SAMHSA and used to prevent too many false positives for traces amounts of a drug in someone's system. The cutoff levels are different for each drug and most workplace drug testing use a standard set of cutoff levels. However, law enforcement and addiction treatment programs will sometimes use a lower cutoff level in their testing since they have a zero tolerance policy. If you are using a home drug test, you will want to make sure the cut off level of the test you are using is the same as the one you will be taking elsewhere. Please check your instructions for more information on the cut-off levels being used in your test. One Line appears in the Control Region (C) and NO line appears in the Test Region (T). Positive means that the drug concentration in the urine sample is greater than the designated cut-off level for a specific drug and additional confirmatory drug testing may be needed. Please check your instructions for more information on the cut-off levels being used in your test. The most likely reasons for this are insufficient specimen volume, incorrect procedural techniques or a faulty test. Please read the directions again and repeat the test with a new test card. If result is still invalid, please contact Home Health Testing at 1-888-448-5657.